Hats off to someone who starts his first, serious thrash band as a 12-year-old. This was what Max Seipke did in 2006 when he founded Tormentor. A lot of respect for that! Now, if you aren't a fan of mid-eighties Kraut thrash, you might as well look the other way immediately. There is a lot of early Kreator to be found in Tormentor's music. No, the band name is no coincidence, neither is the choice to include a cover of the Kreator song with the very same title. 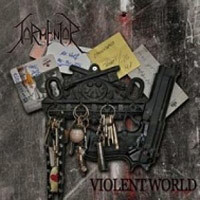 For all it's worth, there are decent passages which echo the tunes of relentless thrash metal from yonder years, but, to be honest, this is not 1985 and if you want to make a real impact, the song writing and performance has to be one notch better than the material the young Germans deliver on 'Violent World'. It's simply not quite there yet. Worth trying: Suicide Commander or the title track.